Today the Seattle Symphony launched Simple Gifts, a multi-year initiative that will share the inspiration of music to spark joy, alleviate trauma and connect individuals with their creativity through artistic projects, residencies and access to performances. The program is an expansion of the Symphony’s current partnerships serving those experiencing homelessness. The initiative was announced at Benaroya Hall today in an event that included performances by Seattle Symphony musicians and community participants as well as remarks by Seattle Symphony President & CEO Simon Woods, Mary’s Place Executive Director Marty Hartman, Path with Art Executive Director Holly Jacobson, and City of Seattle Deputy Mayor Hyeok Kim. The announcement came in response to City of Seattle Mayor Ed Murray and King County Executive Dow Constantine’s declaration of a State of Emergency for Seattle and King County’s homelessness crisis last November. According to All Home King County, homelessness impacts approximately 10,000 people on any given night in King County. “When I took this class I had no idea what to expect…I was unsure what I had to offer. After a few classes it dawned on me that this is the definition of Community. The beauty of Art is that it can be molded into many forms. To be able to add something of my own freedom of self-expression and put it together with other artful minds-alike, demonstrates the beauty of a Community in its artful form. 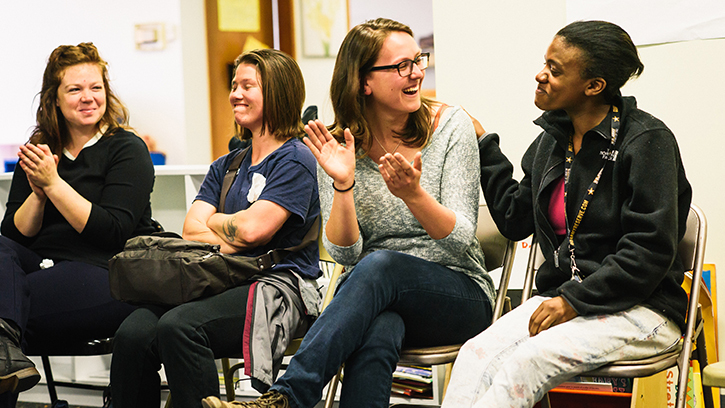 Path with Art is a Seattle organization transforming the lives of people recovering from homelessness, addiction and other trauma by harnessing the power of creative engagement as a bridge to community and a path to stability. The Seattle Symphony began working with community partners serving individuals experiencing homelessness in 2013. The three areas of work with partner organizations encompass the following types of projects: Artistic Partnerships, Residency Programs and Ticketing Programs. These projects will expand and come under the umbrella of Simple Gifts. A new, fourth area in Community Service will be added in the 2016–2017 season, which will bring together musicians, board, staff and volunteers for a collective service project serving those experiencing homeless in our community. Artistic partnerships deeply engage participants in self-expression and the creation of art. Path with Art students will take part in a 16-week residency to create an original score, inspired by artistic banners created by Path with Art students as part of the organization’s interdisciplinary, community-based, year-long We Are All Here project. Inspired by the understanding that in order to solve community problems, we must first come together as a community, We Are All Here makes use of poetry, visual art and music as a way to bring diverse populations together for meaningful conversation. Seattle Symphony Teaching Artist Jessi Harvey will begin working with Path with Art students this October. The resulting score will be premiered by Path with Art students and a Seattle Symphony chamber ensemble in March 2017 against the backdrop of the banners. Youth and adult participants from Mary’s Place, Compass Housing Alliance and two other community groups will create artistic responses or reinterpretations of the holidays in Charles Ives’ New England Holidays in terms of their own personal experiences and communal histories. The community-curated multimedia responses will be displayed as part of the performances conducted by Music Director Ludovic Morlot at Benaroya Hall on February 2 and 4, 2017. Ives’ New England Holidays is a work of art that will spark conversations, inspire reflection and amplify the voice of participants and the project will build deeper community connections for Seattle Symphony audiences. In partnership with Mary’s Place, which shelters families experiencing homelessness, the Seattle Symphony recently concluded the third annual Lullaby Project. The Lullaby Project is a workshop series where Seattle Symphony musicians and Teaching Artists come alongside mothers in crisis situations to create personal lullabies for their children. Over the course of a short two-month period, musicians and Teaching Artists meet with participating mothers in a creative workshop where mothers express their thoughts and hopes for their children in writing. Working with Symphony musicians and Teaching Artists, they pull out words, phrases and themes to craft them into verses and melodies, creating personalized lullabies. Teaching Artists make close to 80 community site visits each year to numerous community partners. Residencies are a regular and consistent presence where Teaching Artists support specific partner goals, such as building self-advocacy, self-efficacy, resiliency, creativity and teamwork skills. Since the Community Connections program began in 2010, over 6,000 tickets have been given free to community members who would not otherwise be able to experience symphonic music. These tickets are distributed through 60 partner nonprofits across six sectors including: youth, cultural, health services, social services, seniors and military organizations. Of these, 15 partners specialize in serving those experiencing homelessness, but many others also serve low-income groups or those who are at risk of homelessness. Under the name Simple Gifts, the Seattle Symphony’s Community Connections program will expand as an organization-wide commitment to share the power of music to spark joy, alleviate trauma and connect individuals with their creativity. The “gifts” refer to the simple dignity, joy and hope that music and the creative process can bring to others, and what the Seattle Symphony hopes to bring to all members of its community. For information on how you can support the Seattle Symphony, visit us online or call 206.215.4832.